On Tuesday, March 13th, Oregon Tech defeated top-ranked Northwood University 63-46 to win the NAIA Division 2 national championship. Danny Miles who invented the Value Point System now holds the NAIA Division 2 record for most national championships. They also set a national championship game record for fewest points allowed. Danny Miles who is featured in the Value Point System and 6 Daily Drills DVD recently helped Florida’s Billy Donovan, Washington’s Lorenzo Romar and North Carolina’s Roy Williams pick out Team USA for the 19u squad. Miles served as one of the three court coaches at the recent tryout camp at the U.S. Olympic Training Center in Colorado Springs, Colo. 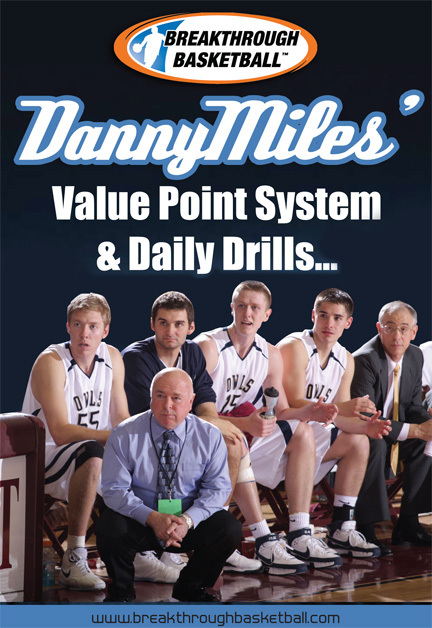 Check out this new DVD and Book about the Value Point System that Danny Miles credits as the key ingredient to his 880+ wins at the collegiate level. Danny also covers 6 of his favorite drills.